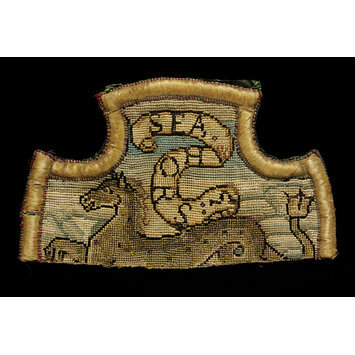 This fragment of an embroidered panel depicts a sea horse. It is part of a collection of needlework known as the Oxburgh hangings. They were made between 1570 and about 1585, the work of Mary Queen of Scots during her imprisonment in England and Elizabeth (Bess) Talbot, Countess of Shrewsbury. Bess’s husband George Talbot, Earl of Shrewsbury was responsible for Mary and she stayed at one or other of the Shrewsbury estates. Embroidery was a form of therapy and communication for Mary, as well as a conventional occupation for wealthy and elite women. Most of the motifs depicted were copied from the wood-cut illustrations of emblem books and natural histories by well-known authors such as Claud Paradin, Conrad Gessner, Pierre Belon. These often represented sentiments and morals from classical literature and contemporary folklore, and were chosen Mary to express her most private thoughts at a time when all her written correspondence was being monitored by her captors. This panel of canvas work (stitching over the threads of a coarsely woven linen) is embroidered in coloured silks, silver and silver-gilt thread. Those executed by Mary bear her monogram, the letters MA superimposed on the Greek letter phi and those by Bess, the initials ES. 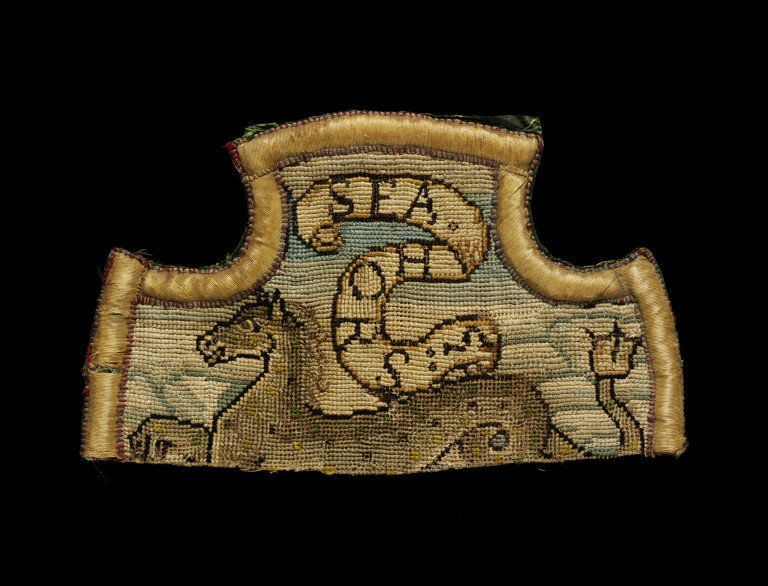 Not all the panels were embroidered by Mary and Bess, as household accounts show that both had professional embroiderers on staff. The existing ‘hangings’ consist of a of wall hanging, two bed curtains and valance, on permanent long-term loan at Oxburgh Hall in Norfolk. 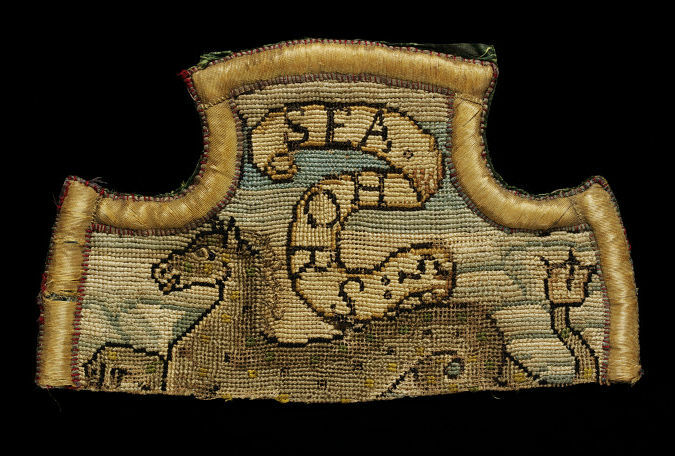 However these were probably not the original arrangement of the embroidery, but sewn together in the late 17th century. This group of 33 embroideries are the remains of another hanging, now unpicked. Cruciform textile panel of embroidered linen canvas with silk and silver-gilt threads. Horizontally cut in half, and embroidered in blue, grey and white silks with a raised border of silver-gilt embroidery. Depicts a sea horse. The Oxburgh Hangings. Hanging with applied panels of embroidery, formerly at Oxburgh Hall, Norfolk.